90% less radiation in your home. 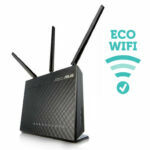 The most economic eco-wifi router for use with all modern smartphones, tablets etc. Compatible with Comcast, AT&T, Time Warner, Verizon, and all other providers (provider independent). Connects with your existing modem to reduce EMF. How to install your Eco-wifi router. Power adapter 100-240V 50/60Hz included. Plug adapter included free of charge for US, Canada, Australia/NZ and UK orders. Reduce WiFi radiation by 90% in standby: signal is only transmitted once every second. Connection throughput speed and network stability remain the same. Scheduled automatically fully (100%) switch off Wifi radiation (for example at night). LAN ports for wired internet keep functioning. On/off switch for wifi transmitter. Cabled LAN ports keep functioning. Easy installation. The Eco-WiFi router is connected to your internet modem using a standard network cable (included). If your internet modem has built-in Wifi, switch off its Wifi function. You may ask your internet provider’s customer service how. All functions of your existing internet modem, like for example internet telephony, can still be used. The exposure to EM radiation from the laptop or other wirelessly connected equipment remains unchanged. Set your smartphone to switch its wifi off in stand-by mode. In some cases you can reduce the transmit power of your computer’s WiFi adapter using the Device Manager in Windows. A wired internet connection is radiation-free and minimizes health risk. So far, I have set up two of these routers and have not noticed any performance issues compared to the models they replaced. If this low-radiation approach works so well, why aren’t all manufacturers following suit? Many thanks to Cece Doucette and the film Generation Zapped for alerting me to the issue of EMF radiation and its adverse effects on health. And, of course, thank you to Jan-Rutger Schrader for inventing such an item! Very happy with our WiFi from your company. Set on lowest setting in our garage and works well through out our home. I’ve been very impressed with this WiFi router. I think the best part is that you have the ability to make the signal stronger or weaker depending on your needs. I also am using the feature that automatically turns the router off at night and back on in the morning based on the parameters I set. I wanted to purchase this product to reduce the EMF’s from WiFi since our router is near the kitchen and family room , where I spend most of my time during the day. I have 2 WiFi TV’s that I stream Netfilx and Amazon on and I haven’t had any issues streaming. I also have Sonos speakers (gasp) that my husband is unwilling to give up. We had trouble with the speakers working on the network but he hardwired one of the speakers to the router and it resolved the issue. Success! I am very satisfied with this product. I purchased JRS eco-wifi in order to reduce the electromagnetic radiation in my flat while being nonstop online. The device works very well and the radiation level is really low (measured by RF-meter AM-10). I appreciated the simple and quick installation. The menu offers vast options for various setups. I like especially the time-schedule manager and the possibility to control the level of radiation power. Considering a lot of advanced option, the manual is quite simple and covers only the basic setup. I would appreaciate having the full manual. Thank you for your reply and support. I followed your advice and succeded to set up the router with the required VNP access. It works! I just wanted to report that I love how this router works. I watched a youtube video on how to use the software from electrosense. Overall it was easy to get online. I have the router on power level 10 to use wirelessly and when I need to print I power up to 30. Thank you for inventing a clever product. 1. My JRS Eco Wifi 01A Router is working very well. It was easy to install. 2. As recommended, I turned off the WIFI on my existing modem and just use it for wired internet. 3. I plugged the JRS unit into a remote-control switch so we turn the WIFI on and off remotely from elsewhere in the house. 4. I set the JRS unit on a lower power setting and it reaches through the entire house. Iam very happy with this router for its performance less radiation also I worry with the new 5g technology and its harmfull influence for humam health thats the main reason I bought this router . I finally got my router yesterday and I’m glad I ordered the 01A. I just want to mention that the eco wifi software is very well designed and implemented. Despite what you said (25 mbps max) I’m getting 70mbps at about 15 feet from the router with the transmission power at 1mW. This is the speed my current standard N300 provides as well so this model is perfect for me. Router works well. Using an EMF meter we have been able to measure that indeed only 1 pulse per second is emitted, even when using wifi. 1. How is your experience with the JRS Eco-Wifi? Very satisfactory…Installed easily and connected to my ISP smoothly with their help/instructions. 2. What was your motivation to buy the JRS Eco-Wifi? I wanted to reduce WiFi exposure for my wife as the router is located in the center of the house where she spends the majority of her time. Her computer is hard wired, and we only need WiFi signal when I need connection. Also great to easily shut down WiFi exposure in our bedroom when sleeping. 3. To whom would you recommend the JRS Eco-Wifi? Anyone wanting to limit WiFi wave exposure. Like many people in the UK we have a dual band BT Hub Wireless router which initially I thought was great – the family could download movies & play games with no wires!. Then I started hearing about how the WiFi signals were actually the same microwave frequency as in a microwave oven and can be dangerous to health. At 1st I didn’t believe it – so I bought lots of books and researched many research papers on the subject and bought a meter. One of the better books is ‘EMF Freedom’ by E. Plourde. The meter was really helpful because when I thought the BT WiFI router settings were set to ‘WiFi off’ – the router was still sneakily pulsing it out!! The BT Hub Router has no switch on it to turn off the WiFi . Rather you have to change the settings in two areas – first turn off both the 2.4 and 5 GHz broadcasts in the Router settings. Second, sign into your main BT account and opt out of wi fi from there. Then reboot the router! Initially i bought the JRS Eco router because Lloyd Burrell on Electricsense.com recommended it as it can reduce radiation by 90%. The JRS Router plugs into the back of the main broadband router. In the JRS router settings you can reduced the strength of the signal – so instead of the signal reaching say the neighbours house – it just reaches only the rooms in your home. The best feature of the JRS Eco Router is the button on the back where the WiFi can be toggled on and off. Since doing the research – we no longer have wifi in the house – however for those few occasions when it’s needed – we temporarily switch it on then off again. Initially when I turned the router on in the morning, it would default to broadcast WiFi and I would then switch it off (all our devices are hard wired now). I asked Jan-Rutger if this could be changed and he sent me the instructions on how to change the settings so that the Router automatically is not in wifi mode when it is switched on (you then press the button to switch it on). If you are a skeptic about the health effects of WiFi – just do a Google search for ‘Martin Pall WiFi and Health’ and have a look at Science Direct. Thanks Jan-Rutger – this is an excellent piece of equipment and works flawlessley. I am very happy with my JRS wifi. It works just as well as the wifi I had before but with less EMF’s. I love how it turns off and on automatically each day. It reminds me that it is time to get off of the computer and go to bed! It is a great product that I highly recommend! I’m in the US. The router is great, I have an RF radiation meter and it measures lower and the power control to go from a regular router at 10mW to only 1mW is great. Any confusion or problem I had was so professionally addressed swiftly and resolved. I love this router and the company. At both places I had to install it I immediately felt better when I switched over. You just really have to watch that your wireless company has in fact turned off all their wireless frequencies. For example- Verizon – on myfiosgateway online it showed both my 2.45GHz and the 5GHz signals were turned off. But my Acoustimeter (measures RF radiation) showed that it was still sending out wifi. They completely argued with me that was impossible. I unplugged it and watched my meter go down. Plugged it back in and watched the meter peak out again. It turns out these companies send out another signal they don’t tell you about that sends free wifi to the street. You have to talk to a senior supervisor who knows how to turn that off. Unreal. Once done- your only wifi (should you turn on the button) is the JRS eco router and your body mind and spirit will feel more comfortable. It’s very palpable and visceral for me. I feel the differences. It’s still wifi of course but a better management of wireless hygiene. Gratitude for this company! 2. How was your experience with the JRS Eco-Wifi? Easy to install: concise, information packed manual. The only drawback I found was, that if you configure the router as a switch, the timer function in the router did not work anymore. Jan-Rutger gave me a workaround to set the system time manually and now it works perfectly. The only disadvantage is that if the power goes off you need to set the time again. 3. My experience with the service is very good. I was assisted 2 times by email to fix the settings. I’ve really appreciated this router as I can set it to the lowest setting and still get high speed internet throughout my house. I use wired internet and when I need wireless, can turn it on with a push of a button on the router. Peace of mind to know that EMF are very low. Had a friend use a tester throughout the house. Excellent product ! Entirely satisfied ! My wife an I had a baby, so we wanted to settle things properly and the most healthy we could. The Jrs eco wifi was a key tool of this “down to earth” way of living. Great device, fast delivery and good after-sales service. I have had the router for such a long time already that it is almost time for a replacement. At my place, the built-in wifi is switched off in the modem of the Internet provider, and wifi runs through Eco-wifi! I bought your Eco Wifi router some time ago. Because I am rather concerned with radiation exposure, I also have measurement equipment and I could clearly measure the difference. Using this equipment I have shown many acquaintances what the problem is in our households. But also that there are solutions, like your Eco wifi equipment. In fact, every router should be equipped with such an ECO mode. At our ISP KPN they also have an ECO mode, but that is not comparable to your solution. If I can give you a tip then it should actually be arranged in such a way that the Wifi is always switched off and only turns on if there is use. But the current solution is also already the best available. But it will only be adopted when everyone has an EMF radiation meter. Because seeing and hearing makes you believe. Maybe another tip. With this eco router I was able to set the transmit power to the minimum so the wifi signal only just reached the far corners of the house. I also programmed it to turn off at night and on again in the morning. We are much happier knowing that our family’s exposure to WiFi radiation is minimised. The next step would be to totally get rid of WiFi in our home… sometime in the future maybe..? This router has a measurably lower RF signal than our old router, so we are very happy with it. I’m happy with it! On to a low radiation nation! An excellent product, does what it needs to do, reliable and solid. That it is also more energy efficient and healthier was the reason I bought it, and that still feels very good. I would buy it again. I am very happy with the Eco wifi. I always have good range. I purchased the Eco wifi because I want less EMFs in my home. I only switch it on when I need Wi-Fi. It is usually turned off. I can recommend the Eco wifi to everyone, because as it turns out the high radiation from other routers is not at all necessary. Great router, great signal, just like the regular one. I love the fact that I can switch it off with a button and control the transmission signal strength !! Excellent router! I bought this because we live in an apartment, and I didn’t want my 2 year old daughter constantly exposed to WiFi. We turn it off all night, and I weakened the signal so that it barely reaches the bedrooms when it is on. Highly recommend it! I am sensitive to wifi. My partner is not. I purchased the JRS Eco Wifi as a solution to our living situation and needs. We have tested the router with the wifi on and off. When the wifi is on, my RF meter shows a low reading from a few feet away, yet anywhere in our 2 story house, the wifi is accessible and fast, sufficient to live stream and do everything we need. A button on the back allows it to be turned on and off, and an indicator light shows the status. Also an online menu allows the wifi function to be programmed to be on and off whenever you schedule it. I bought the single band model with 2.4 GH only. The dual band model has more program features that perhaps some people would want. As most of our electronics are direct wired using CAT 5 cables, the wifi is used when needed. And when needed, the ‘low’ power wifi does everything. I am grateful to have this product! I paired it with an Arris modem with a phone connector designed to work with Xfinity, and am perfectly happy with the functionality. After experiencing continual nausea and headaches I discovered that the router in my bedroom left on 24/7 had something to do with it. I have not felt better in two years, this product is revolutionary non eco-wifis should be banned! I am very concerned about EMF radiation for everybody in my house hold. I purchased the eco WIFI router, set the range, the time to come off and on and router name and password and all our devises work just as they used to. For a few years now, we have been trying to reduce radiation in our home. Of course, a suitable wifi router is part of this. We are very satisfied with the router! When we did not have a good connection for a while, we were assisted by JRS. In short: a fine router from a company with good service, so a definite positive recommendation. I appreciated the fast response to my email questions and that I was able to hook up the router and have it working on my own. The connection seems excellent. I feel good knowing that my home has low or no wifi signal. It is great! I had to have it installed by our computer man, because this is something I am not good at. Just not digitally-experienced enough. It works just as well as my old router. I love the fact that I can schedule it to turn off and on automatically. When it turns off, the family gets ready for bed, no arguments. I bought two, one for my daughter, who convinced us to give this a try, and one for ourselves. I feel better knowing that there is less radiation in our home at night. We moved the smart meter 100′ from our home and now we put all of our devices on airplane mode before bed. I would only buy such a router. You can still use it even with 1 mW and in a small apartment this is enough. Especially with small children it is very valuable to find alternatives to conventional products. I can definitely recommend this router. First a small problem with the connection, but JRS quickly solved it. We wanted to expand our low radiation network and went to JRS via Google. He made us enthusiastic for a radiation-free router. Extensive advice received. At home, the Eco-wifi was installed satisfactorily. Later on, we were given expert help with the Eco-wifi control network and we were reminded of the possibility of connecting the iPad directly to this network. So now no more radiation at all via the iPad. Results cannot be measured directly by us. With the JRS measuring equipment and then we found out that the later installed router for the wireless video connection cancelled out the effect of the Eco-wifi by its radiation. So we have to change this router in another place. 1. How is your experience with the JRS Eco-Wifi? Great bought my own for our home. Then with Jans help replaced our little children’s Schools wireless network, all working well! 2. What were the results of using the JRS Eco-Wifi? 3. To whom would you recommend the JRS Eco-Wifi? 4. What doubts did you have before ordering the JRS eco-Wifi? None really, I spoke with Jan and could tell he was a good man. 5. How many stars would you give for the JRS Eco Wifi? On a scale of 1 (bad) to 5 (good). 6. How many stars would you give for the service? On a scale of 1 (bad) to 5 (good). Quick shipping, the instructions were easy to follow and straight forward. I like the firmware UI. I’m happy my six sixth was right about my ISP modem been an issue on my health since lately I had issues with my large intestine. Ever since I started using the jrs eco wifi. I haven’t been having any more issues with my stomach where I had to utilize herbal remedies. I like it, nice idea that there is less radiation. Product works properly. Connecting is easy, but do take note about turning off the built-in wifi of your internet modem! Was simple to install. However for me there is no way to know whether the radiation is actually reduced. Apparently that is a matter of faith. JRS Note: You can measure it with the gigahertz HF35C or look at the video on this page in the right sidebar. What doubts did you have before ordering the JRS Eco-Wifi? What made you look for this kind of product? Well I have electromagnetic hypersensitivity and I don’t like wifi but I need it, so I had to find something that would work. And from the looks of it, it looked like it had 90 percent reduction and I have used my meters to verify it. And I like it. I am happy with it. How was your experience with the JRS Eco-Wifi? What are you most satisfied with? The lower emissions of radio freqencies. What were the results of using the JRS Eco-Wifi? I like that I can turn it off manually, that I can program it to turn off at night and that when it’s on it doesn’t blast out as much wifi. As a result I am happier that my family is in a healthier environment. Would you recommend the JRS Eco-Wifi? Yes, I already have actually. I have recommended it in a couple of facebook groups. Anything else you would like to note or do you have any questions? No, I like it a lot, and I am proud to tell people about it when I get the chance. How many stars would you rate the JRS Eco-Wifi on a scale from 1 (bad) to 5 (good)? How many stars would you rate the service? What doubts did you have before ordering the JRS Eco-Wifi? Or what made you look for this kind of product? About the radiation, the health. I have no way to verify, to measure so I have to trust you. How was your experience with the JRS Eco-Wifi? Again, I have no way to check, to verify. I do not have a meter. We wanted to reduce the radiation. The wifi is working well. To whom would you recommend the JRS Eco-Wifi? I would recommend to anyone. Also outside, for schools, public buildings, cities. Anything else you would like to note? I am a teacher and for the first time there were students with hypersensitivity to radiation. How many stars would you rate the product on a scale of 1 to 5? Absolutely 5 stars. Go on and convince more people about this. It’s very important. Fine delivery, right on time. Extensive manual for a great working well configurable modem, we have brought down the power a lot and it still works fine. It is really fuctioning well! And it seems more relaxed in the house. (Translated from Dutch).